GE Power said that it has won equipment and services deals worth more than $60 million to power and provide critical maintenance services for a period of 12 years for the 330 megawatts (MW) Thar Energy Limited (TEL) Power Plant in Pakistan. The TEL Power Plant is owned by Thar Energy Limited - a consortium of the Hub Power Company Limited (Hubco), Fauji Fertilizer Limited (FFC) and China Machinery & Engineering Corporation (CMEC). The power plant will use Pakistani lignite coal from the local Thar Block II mine and supply power to the national grid under a 30-year power purchase agreement (PPA). The 330 MW TEL power plant is expected to commence commercial operations in March 2021, and once in operation will provide the equivalent electricity needed to supply up to 600,000 Pakistani households. TEL is a part of the larger 1,320 megawatts (4x330 MW) Thar Block II integrated-mining and power plant plan, which is also included in the China Pakistan Economic Corridor (CPEC) program. Hubco currently produces 1,601 MW through three plants located at Hub, Narowal and Azad Jammu Kashmir. It is the only power producer in Pakistan that is executing three projects worth over $3 billion, listed in the China Pakistan Economic Corridor (CPEC), namely the 1,320 MW imported coal-based China Power Hub Generation Company (Private) Limited (CPHGC) at Hub, the 330 MW Thar lignite-based Thar Energy Limited (TEL) at Thar and the Sindh Engro Coal Mining Company Limited (SECMC) developing Block II of Thar Coal Field. GE will provide its advanced Circulating Fluidized Bed (CFB) boiler and its steam turbine generator technology for the TEL Power Plant. Thar lignite coal contains up to 50 percent moisture and low ash content, making it significantly challenging to burn reliably. GE’s boiler technology has been a preferred technology-of-choice on Thar lignite fired power plants because of GE’s successful track record burning similarly challenging fuels in Europe and North America. Pakistan has about 180 billion tons of lignite reserves and GE’s technology can help the country use this indigenous resource instead of importing more expensive fuels to increase energy independence and save foreign exchange reserves. Under the Multi-Year Agreement (MYA), GE will provide critical services to support maintenance outages, including the supply of spare parts, on-site inspections and advisory services for improved operations of both the boiler and steam turbine generator at the TEL power plant for 12 years. 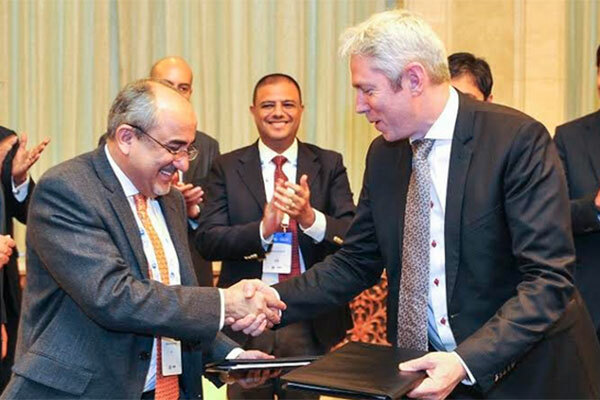 GE and Hub Power Services Limited (HPSL) – a wholly owned subsidiary of Hubco – also signed a broader Operations & Maintenance (O&M) Collaboration Agreement, where the two companies intend to explore opportunities to jointly provide O&M services to coal-fired power plants in Pakistan and the broader Mena region. The collaboration will bring together GE’s experience in enhancing the availability and efficiency of critical power equipment with Hubco’s experience in providing O&M skills for power plants. Globally today, GE’s steam turbines equip up to 30 percent of coal-fired steam power plants and 50 percent of the world’s nuclear power plants. In Pakistan, GE has supported the development of energy infrastructure for more than 50 years. Today, GE-built technologies can generate the equivalent power needed to supply up to 30 percent of the country’s electricity.